A special lunch for a special Mum. 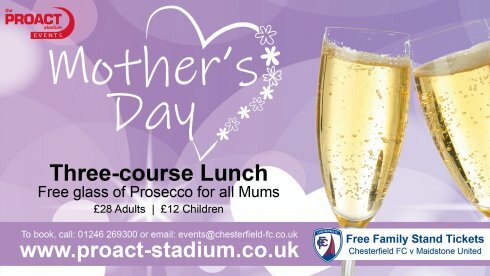 Treat your Mum to a superb three-course lunch here at Proact Stadium on Mother's Day, Sunday 31 March 2019. See the scrumptious menu below. And as an added bonus we're giving away FREE Family Stand Tickets to the Chesterfield FC home match against Maidstone United on Saturday 13th April to everyone that has lunch with us on Mother's Day! Just £28 per adult and £12 per child under 12 years, including a FREE glass of Prosecco for all Mum's. To book call 01246 269300 ext 4162 or email events@chesterfield-fc.co.uk.